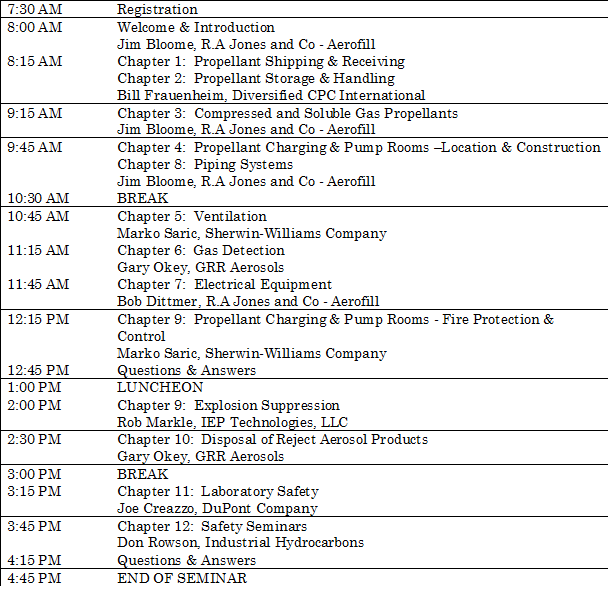 Home > January 2016 > Register Now for the CSPA/SATA Aerosol Propellants Safety Seminar March 16 in Atlanta! Register Now for the CSPA/SATA Aerosol Propellants Safety Seminar March 16 in Atlanta! Registration is now open for the CSPA Aerosol Propellants Safety Seminar, co-sponsored by SATA, to be held on March 16 (immediately prior to the SATA Spring Meeting) in Atlanta. Register at http://www.cspa.org/events/open-cspa-events/. Both CSPA members and SATA members are eligible for the special CSPA member rate. An initial draft seminar schedule (subject to change) is below. Address: Atlanta Perimeter Marriott, Atlanta, GA.